What an amazing summer we’ve had, and we’ve got just the way to end it. 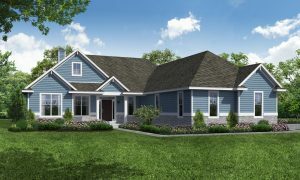 We are once again featuring homes in the Sheboygan Parade of Homes. This beautiful custom home is located in the Windmor Estates, a Hillcrest Community boasting 78 + acres of natural beauty. Functionality meets comfort with an open concept Kitchen, Dining, and Living, and the two-story windows offer serene views of the nearby woods. Not one, but two masters! Each Master Suite offers an incredible walk-in closet and equally luxurious tiled shower. The second story loft overlooks the open concept living area, and can function as an office, or lounge area. This 3,024 sq. ft. home is an exemplary example of our ability to design with unmatched quality and character. If you’ve been wondering about that condo lifestyle, now is your chance to take a look at our wonderful Willow Creek Community. Located just north of Sheboygan Falls, this community is connected to the downtown area with paths for walking or biking. The community clubhouse offers space for large gatherings and an exercise room. 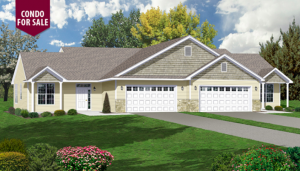 Duplex ranch style homes with a split level design offer 1500 sq. ft. of manageable, yet airy living space with 9′ ceilings, extra tall windows, and an open concept design. Hope to see you at the Parade of Homes! Hillcrest Builders are excited to be a part of the 2018 MBA Spring Tour. The Plan: We have built a Barbara model home. This plan brings contemporary living right to your back yard. The Barbara is split bedroom ranch located on 40 acres of beautiful woods. The Living Room features large beams, a fireplace with built in cabinets and a panoramic view of the woods. The kitchen has a 13’ long island, huge pantry and separate wet bar. The Master Suite includes fantastic views with an attached bathroom. There are two other bedrooms that share a Jack-and-Jill bathroom, and full-walkout basement with tons of sunlight that adds another 1,041 sqft of living space. Nothing will bring you closer to nature than this ranch level home! If you find this style isn’t for you, we will be there to discuss what your ideal living situation is. The address is W172 N7964 Shady Ln. The Location: This home is located in the Overlook Trails Community, located in the heart of Menomonee Falls. It is in walking distance from a Hospital, Valley View Elementary, and the Fox River. Menomonee Falls is a safe, family friendly neighborhood. Great for established families or couples looking for a quiet get away.